Matthew Magain is reporting live from the FullCodePress web-site-in-a-day competition in Sydney, AustraliaÂ â€”Â an event that SitePoint is sponsoring. Raena and I arrived at the FullCodePress event just as things were kicking off —Â the two charities have been announced, and the teams are busy questioning their respective clients and planning how they’re going to build a professional site that meets the needs of these two organisations. The Australian team’s charity is the Disability Discrimination Legal Centre of NSW, an organisation that provides legal advice to people who have been treated unfairly because of their disability. 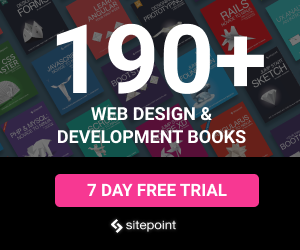 The client provided the Aussies with two large folders of site designs that they liked and didn’t like, which will be an interesting challenge for Aussie designer Alexi Paschalidis. 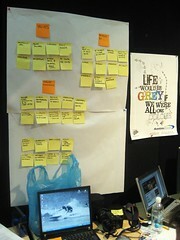 The post-it notes and whiteboard sketches are slowly taking shape. The New Zealand team, the CodeBlacks, are building a site for Rainbow Youth, a New Zealand-based sexual advocacy group dedicated to supporting queer youth. The team spent a couple of hours with the client, and are currently in the process of establishing some templates and mapping out an information architecture. Their client was also extremely well prepared (and well versed in what is achievable with the web site), which CodeBlacks project manager Haydn Thomsen informs me was surprising but also means the brief may be more ambitious than anticipated. One aspect of the competition that will be interesting to watch is the fact that the Aussies are running with a WordPress solution (based on the client wanting to be able to expand via plugins) whilst the NZ team are using BrowserCMS, an open source Rails-based CMS. Last time this event was held, the Kiwis rolled their own CMS from scratch. Whilst they ended up being victorious, it was certainly an enormous risk that could have gone the other way. The atmosphere is heating up — possibly because more and more random attendees wandering about the CeBIT conference are getting curious about the event and how each team is tackling their respective projects. I expect that having an audience whilst you work must add quite a bit of pressure to the competitors (as if building a complete web site for a real client in 24 hours wasn’t pressure enough), but so far I can’t see any cracks appearing. Everyone seems calm, composed, and is just getting on with it. 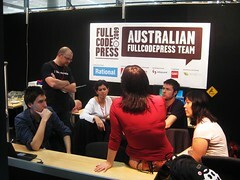 Follow the FullCodePress team online, via Flickr, Twitter, YouTube and the official blog.